Dorothy Martin and her husband Alan have been invited to rural Suffolk to take part in the christening of the newest member of the aristocratic Montcalm family. 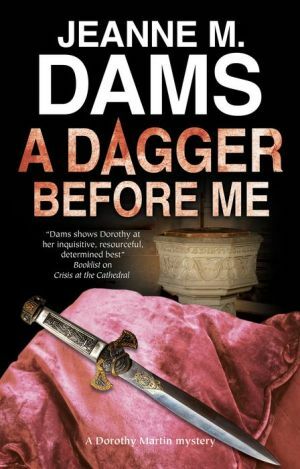 But on arriving at Dunham Manor, they discover the household in turmoil as the ceremonial dagger used in Montcalm family christenings for generations past, has gone missing. Dorothy and Alan offer their help in locating the ancient heirloom, but when a stranger is murdered in the village – stabbed in the back with an ornate dagger – Sir Edwin Montcalm finds himself the prime suspect in a very puzzling murder. It will take all Dorothy and Alan’s well-honed investigative skills to untangle a web of long-buried secrets, historic conflicts and murderous inclinations which threaten to destroy the traditions and the very existence of the Montcalms’ way of life for ever.